Harness the power of our certification training today. 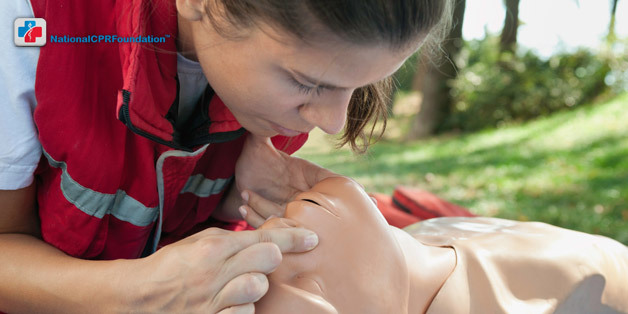 Earn Your CPR & First-Aid Certification Online Today! Online Certification Courses Strictly Adhere to OSHA! 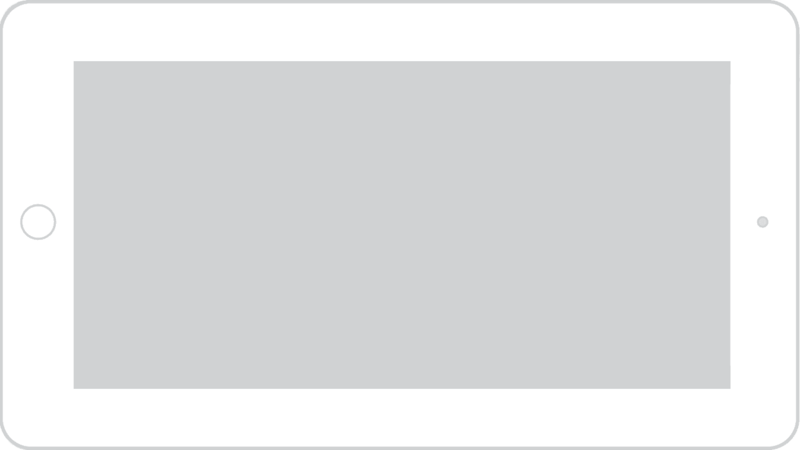 Receive a PVC/Vinyl Wallet Card absolutely FREE – A $5 value! A Reputation Built Upon a Quality Healthcare Service! How Can National CPR Foundation Help You? At NationalCPRFoundation we offer certification courses for Workplace Employees, Healthcare Providers and the Community. We're accepted by thousands of companies and institutions and trusted by hundreds of thousands of Professionals across the United States, Canada & Worldwide. Learn Useful Life-Skill Techniques Through Video Demonstrations! All courses are FREE! Only pay for certification. Our Accredited Certification coursework are AHA® & ECC/ILCOR 2015* Compliant! Courses Strictly Adhere to OSHA! Our online certification courses incorporate the latest scientific guidelines and are aligned with the Occupational Safety and Health Administration's (OSHA) Best Practices. Our Accredited Certification coursework are AHA® & ECC/ILCOR 2015* Compliant! Certifications endorsed by AHA experienced Health Providers! Plus, receive your Certification & Temporary Wallet Card instantly, after your purchase. All courses and Exams are FREE with 24/7 availability. Don't purchase your Certification unless you're absolutely satisfied! No Upfront Costs! No Hidden Fees! 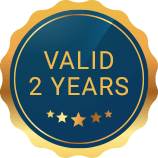 All Certifications are Valid for 2 Years! Don't purchase your Certification unless you're absolutely satisfied! Our guarantee is simple: Your acceptance or your money back! We Pay Shipping/Handling so You don't have to! Nationally & Internationally Accepted! Our online certification courses incorporate the latest scientific guidelines and are aligned with the Occupational Safety and Health Administration’s (OSHA) Best Practices. Upon a successful purchase you'll receive your Certificate and Printable Wallet Card on-site and via email, Instantly. You will receive a FREE PVC / Vinyl Wallet Card in the mail within 2-5 business days! We also provide Free Shipping & Handling! 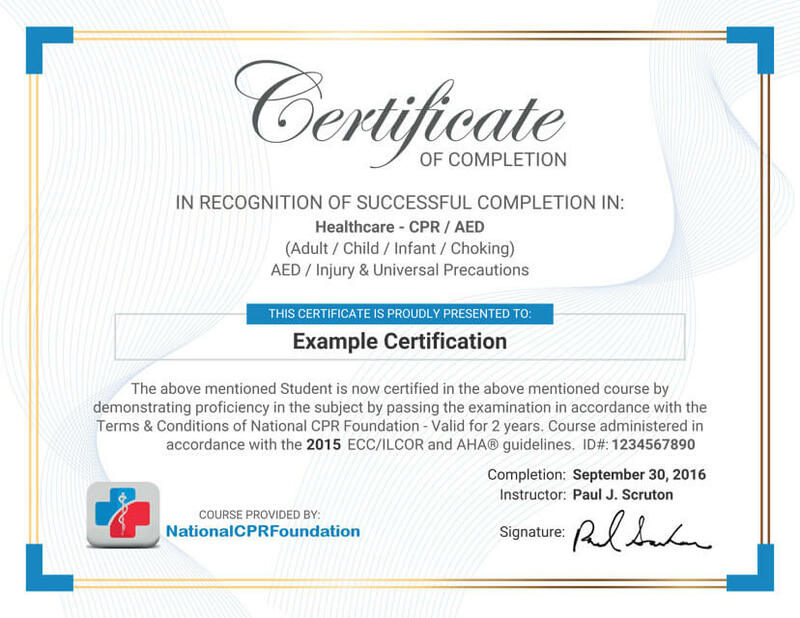 All of National CPR Foundation's Certification Courses are Nationally & Internationally Accepted. Since we're based in the U.S. and follow the AHA and ECC/ILCOR (the U.S. Standard) our National and International acceptance rate is exceptionally high, at 99.7%. We have a 24 hour Email Support Team ready to answer any and all questions you may have. Please click FAQ's to review our Frequently Asked Questions page or Contact Us. We offer significant savings on all Group Packages - Beginning with a 20% discount group package with at least 5 or more employees. You save as you purchase more; discounts increase incrementally. For groups larger than 200, please Contact Us. We have training options which will fit your needs whether it's for healthcare, workplace, or community CPR. Our group certification training is an efficient, low-cost premium service with industry leading recognition. Let us fulfill your certification needs with on-demand downloads of certs and cards, downloading receipt options, complete roster of staff verification and options of new purchases all from the administration dashboard. Our curriculum is based off of the latest 2015 AHA®/ECC/ILCOR Guidelines. At NationalCPRFoundation, we provide professional certification and recertification in Cardiopulmonary Resuscitation (CPR), Basic First Aid, Basic Life Support (BLS) and Bloodborne Pathogens training for Workplace Employees, Healthcare Providers and the Community. Explore our courses and remember, all courses are backed by with our guarantee: your acceptance or your money back. Don’t make a purchase unless you’re absolutely satisfied. Pay after successfully passing your test. All courses can be completed online in just a few hours or less. Once you have completed an examination via our quick and easy online system, you will receive a PDF copy of your certificate immediately via email as well as your card within 2-5 business days. All courses follow the latest American Heart Association (AHA), ECC, ILCOR guidelines. With a wide range of revision and test preparation materials, you can put yourself in the best possible position for passing your tests. Why face the stress of taking a test in-person? You can prepare with unlimited practice tests, unlimited access to course materials and free downloadable courses. For added peace of mind, you’ll even receive ongoing support after you have achieved a pass grade in your chosen qualification for certification or Recertification. In our CPR certification course you’ll learn to perform CPR (Adult / Pediatrics) and how to use an Automated External Defibrillator (AED). In our First-Aid certification course you’ll learn how to administer first aid to adults and children. After you complete the test and receive your provider card, you will be equipped with the skills needed to save lives. 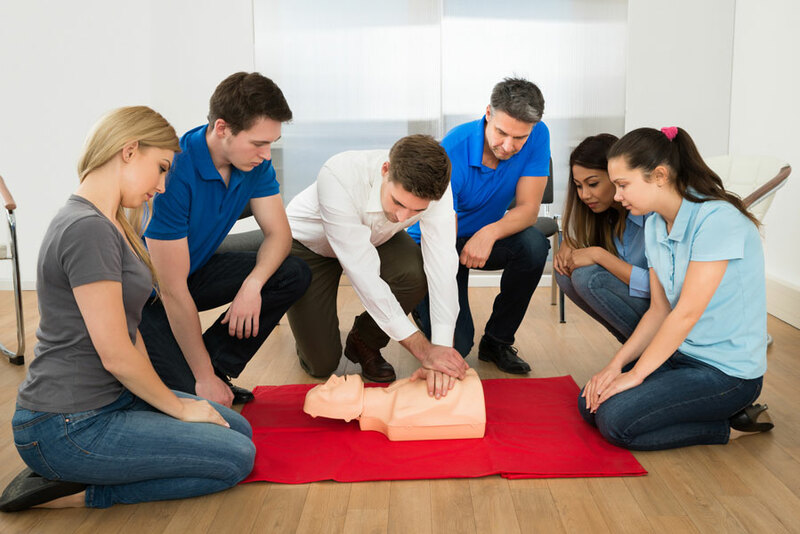 Our CPR and First-Aid certification course covers CPR (Adult / Pediatrics), how to use an Automated External Defibrillator and teaches the proper application of First-Aid. In our Bloodborne Pathogens certification course you’ll learn about BBP prevention, practices, and universal precautions, as well as pathogens, viruses, bacteria and parasites. The Healthcare CPR certification course will help you understand exactly how to perform CPR (Adult / Pediatrics). Cardiopulmonary resuscitation, abbreviated to CPR, is a medical technique that combines the introduction of air and chest compressions to preserve brain function. In our BLS certification course you’ll learn how to perform CPR (Adult / Pediatrics), how to use an AED, how to apply First-Aid while also learning about Bloodborne Pathogens. Our curriculum has been created by American Heart Association (AHA) trained providers to be a timely, efficient, and smooth certification process. 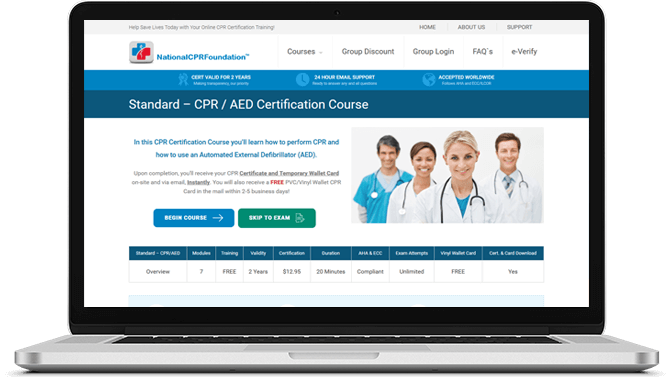 This allows you to undertake your CPR certification or CPR recertification / renewal class online and at your own pace, as well as smooth training for BBP certification and BLS certification. We offer accreditation for CPR certification, BLS certification, First Aid certification, and Bloodborne Pathogens certification. These are vital achievements when it comes to improving your career prospects as quickly as possible and will impress both existing and potential employers. In today’s modern world, busy schedules and work commitments mean that a proficient, efficient and flexible learning process which offers quick certification results is needed. We recognize this, which is why our team of experts have devised industry-leading learning outcomes geared towards successful certification and fast recertification. Don’t miss out on improving your career prospects due to work or childcare commitments. Certifying with us, you can access learning materials via your computer, tablet or phone at your convenience. Our flexible approach to CPR certification means you can fit in revision and study at the most convenient time for you – 365 days a year – it’s completely up to you when you learn, and completely up to you when you take the tests. By choosing CPR certification online at your convenience, you’re more likely to succeed. With 24/7 access to all courses and materials, you can work towards a qualification at your own pace, fitting studying around your busy schedule. It couldn’t be simpler, and with fantastic study guides and support available you’re even more likely to succeed. We’re pleased to offer individual groups as well as corporate Group Discounts on all our programs with instant access after a successful purchase – it’s Group Discounts on autopilot. Whether you’re an employer looking to ensure each of your team members are compliant with health & safety rules, or simply a group of students or friends looking to take advantage of a value-for-money offer, our group discounts make getting certified more affordable than ever. Get started with your group today! We offer significant savings on all Group Packages. All Group Packages begin with a 20% discount. Manage your group’s members, purchase additional courses, and download employee’s certifications and cards. Setting up an account is very simple. After a successful purchase you will be able to manage your Group from your Admin Dashboard. The information from purchasing your Group package will automatically be added to your Admin Dashboard. Once you’ve passed your final test, you will receive PDF copies of your certification and card (immediate printing on site and via email after a successful purchase), as well as a hard card within 2-5 business days. Include your certification into your portfolio as proof that you are qualified. All of our certificates are nationally recognized and will only include the course name, your name, date, ID number and instructor’s name and signature. Our goal is to help you succeed, so we offer 24/7 Support designed to assist with all your training needs. Upon passing your test, you will continue to benefit from unlimited access to the site and study materials, training classes and modules. When it comes to recertification, you’ll already be equipped with the knowledge to pass the test again. Our goal is to prepare you for your test in a streamlined, fluid and effective manner. Our focus is on the most important materials required to pass the relevant test, allowing you to receive your certification in the quickest possible time. Where other courses may try to drag things out, our priority is providing you with the essential knowledge needed to help save lives. It couldn’t be easier to pay for your certification. All transactions are monitored 24/7 with secure technology for heavy encryption from start to finish – meaning: all information is protected. We accept MasterCard, VISA, Discover, American Express, and PayPal. Choose the most convenient path to learning life-saving techniques and achieve qualifications that will boost your employment opportunities and improve your self-esteem. With our results-driven learning outcomes, you can guarantee success the quick and easy way, without even having to leave the comfort of your own home. really good course but maybe a few more videos could be helpful. Straight forward. To the point.